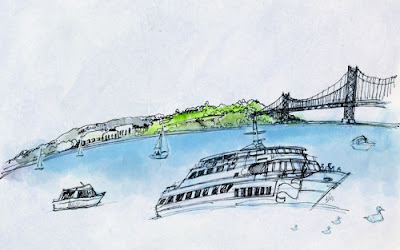 Here’s something I painted while observing the San Francisco Bay. Not quite my usual image style, but it’s fun to try other things sometimes! The scenery just inspired me at the time, so I painted it. Enjoy. Great drawing style and very spectacular perspective! i did enjoy, thank you! Beautifully rendered and a nice style! Vive la difference! yes, i like the curving perspective there. And of course the subject matter! from the ferry buidling? i like how you’ve handled the bridge.